It all started in September 2016. After the heartache of seeing our son Jacob undergoing yet another brain surgery my husband and I decided to throw caution to the wind and try to fulfil our disabled son’s dream of owning his own coffee shop. A few days earlier he had seen a sign for a property to let on the seafront at Marsascala. The place looked abandoned, but at Jacob’s insistence I took a photo of the contact number with my mobile phone and told him I would call when I had time. With the upcoming operation scheduled that was the furthest thing from my mind, but now here we were sitting in the waiting area outside theatre dialling that number!! The following week as soon as Jacob was well enough we went to view the shop. When we walked in as we had expected the place was a shambles. The owner of the property had told us that it had been closed up for 3 years, but it looked like it had been neglected long before that. The plus side to the property was that besides the shop at the front of the building, it also had a large room at the back which we thought would be perfect to use as a meeting hub for our support group Survivors Malta. However there was no denying it, the place was in desperate need of repair. We were a little hesitant at first as it would have meant that a huge chunk of our budget would be spent on refurbishing and would have entailed months of repairs, many of which my husband Sammy would have had to take upon himself to do in order to save money, but then when we opened up the shuttered windows and the winter sun shone through opening up to an amazing view of the sea in front of us; it was at that moment that Jacob’s face lit up and it was then that we just knew in our hearts that this was it. 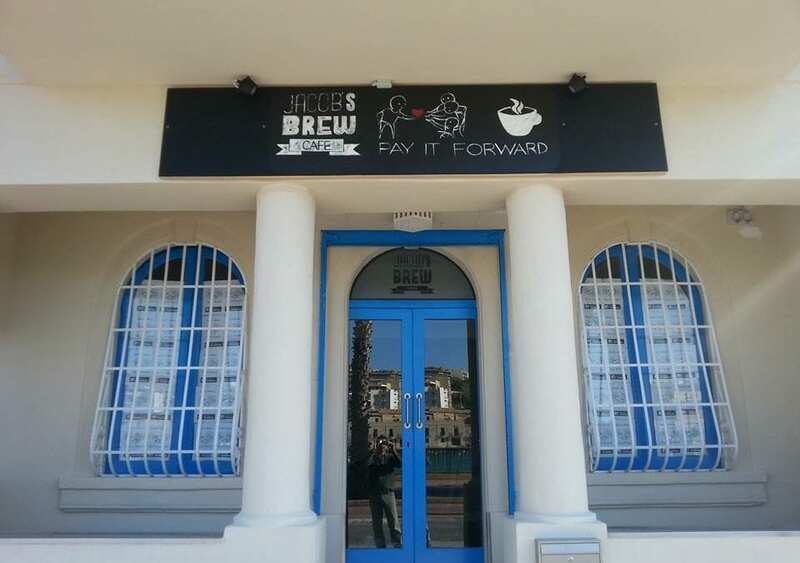 144 Triq Salini, Marsascala simply had to be Jacob’s Brew, his coffee shop!! Within a few days we signed the contract and the deed was done, but that was the easy part. Sure enough as soon as we got the key we began gutting out the shop.There was loads of junk that had piled up over the years and as we peeled away the decay we began to realise that we had bitten off a lot more than we could chew as there was so much more repair work that needed to be done than we had originally suspected. The electricity and plumbing had to be completely re-installed. This would have meant removing the existing gypsum walls and plastering all over. The toilets were broken and needed to be replaced. The stained wall and floor tiles had to be changed …and the list went on and on!! Feeling overwhelmed by it all, it would have been a lot easier to cut our losses and give up because we were more than certain that our budget would not have covered all the expenses estimated to the sum of around €25K and that wasn’t even taking into consideration the cost of the appliances and furniture. Making Jacob’s dream come true looked further away than we had ever imagined! It was at this point when we were at our lowest ebb that Erskine Vella and Chris Attard of Best Deal Properties walked into our lives. David John Dimech at Dhalia had told Erskine about our son’s story and of how we, as his parents wanted to make his dream come true. How the coffee shop would be so much more than that, becoming Malta’s very first social enterprise whereby my family would not only be implementing the pay it forward system, but would also be donating a percentage of our profits to our NGO Survivors Malta to initiate projects to help families facing trauma. Erskine came to the shop with his business partner Chris to offer their expertise and assistance. With the sheer magnitude of the works to be done I thought that they would turn on their heels and run. Instead they offered us a complete make over of the premises. Erskine’s exact words “Leave it to us! !” Needless to say we were gobsmacked!!! We haven’t looked back since. It took us nearly 9 long hard months to turn our son’s dream into a reality with the help of these wonderful people and we finally opened our doors on 28th July 2017. It takes special people to see our vision as we see it and to believe in what we do. Erskine and Chris of Best Deal Properties alongside other wonderful people who donated to us; O‘hea Opticians, Prohealth Malta and even students at MCAST organising an activity on campus to raise funds!! Saying thank you to such people is not enough. We will be forever grateful. We can only repay such amazing people by promising to continue to pay it forward best we can!!! !